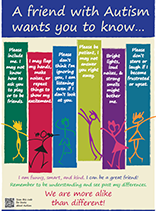 This is a great pamphlet for children who share how to be friends. Learn some key things to make sure people with autism spectrum disorder are included in these important relationships that sustain us all throughout life. This brochure is geared for children to learn facts about Asperger’s Disorder. This social experience story can be used to help a child know what to expect when going outdoors and have fun. Word search, crossword puzzle, vocabulary, door hangers and bookmarks for Autism Awareness Month. If you have a child with autism in your class, this module will be helpful to you. This page focuses on aspects of explaining your child’s diagnosis to him or her, and about resources that can assist and guide you. Series of blog entries describing how a mother presented information about autism to her son’s classmates. YouTube Video made for children by a mom. Useful information to hand out to explain autism to children in public situations. YouTube videos: "Ethan and Dan Explain Autism," "Autism Understanding and Acceptance," and "Intro to Autism for Kids"